Creamy Gorgonzola Pasta with Steak is an easy last minute meal that fits in your budget and yet still is a special dinner! 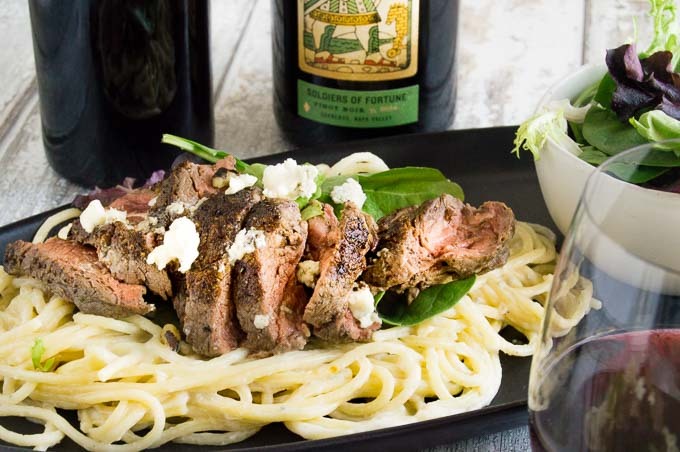 Today’s recipe is for Steak with Gorgonzola Pasta is a budget friendly, yet special enough for company recipe. Made in about 30 minutes served directly from the same pan you cook it in! I’d like to thank the Grocery Outlet for sponsoring todays post. I only promote things I use in my everyday life and in the last 6 months since being introduced to them, I shop there quite often. They have great prices on everything from wine, meats, cheeses, dairy, vegetables…. Basically anything you can get at any grocery store but at much lower prices. Their everyday prices are 20-50% lower than what you can buy at other retail stores so it’s a great place to shop when you want to entertain yet stay with in a budget. How can you save even more than their already low prices? Their everyday prices are fantastic but if you shop now they are running 20% off sale on all of their wines in stock. It’s a great time to stock up for all of your Spring entertaining. Whats even more budget friendly is that if you sign up for their mailing list right now you can also get a $3 off coupon off your entire purchase of already low priced food and wine. How does the Grocery Outlet get such low prices on their wines? Don’t worry, the wines you find are the same quality and delicious wines you can buy at other stores. When wines are sold to buyers they are sold long before bottling or even being picked from the vines. When the crops are harvested and produced there may be a lot more availability due to a hearty harvest. When this happens the wine buyers go in and buy any over runs there may be and pass all of the savings on to you! In some cases the labels on the wines are changed, but in a lot of cases the wines have the same labels that you see elsewhere. On each shelf they price their wine for what they are selling it for and what you will see it elsewhere. It’s a great way to buy quality, great tasting wines at a great price. It makes entertaining much more budget friendly! You can find a store locator here to find a store near you! Entertaining tips for Casual Entertaining within a budget? 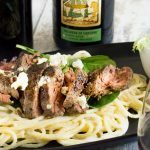 Gorgonzola pasta with steak is a great way to entertain company and be able to serve something special. Your guests will not go away hungry because the pasta with the creamy sauce fills them up, but they still get a small portion of steak to go with their meal. Its easy to serve this meal buffet style directly from the pan you made the sauce in which cuts down on doing dishes when its time for clean up. Each person can easily customize their portions by having additional add ins such as walnuts, arugula and gorgonzola crumbles. Serve with a simple vinaigrette and salad, garlic bread and pair with a couple of bottles of wine and your all set! 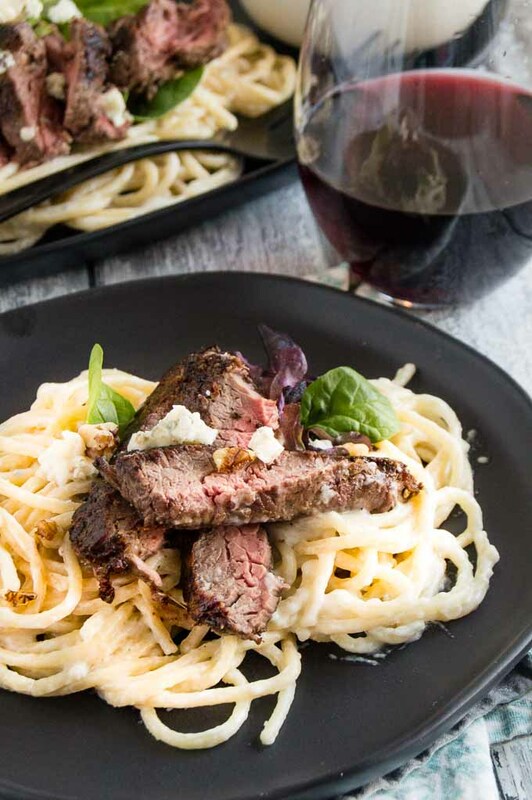 What wines pair with Creamy Gorgonzola Pasta With Steak? The beauty of this recipe is that it works well with both reds and white wines. A Cabernet or Pinot Noir pair well with the red meat and hearty cheese in the gorgonzola sauce. But a nice riesling works very well with the gorgonzola too! Its nice to be able to more than one choice so you can please those who have definite red and white wine preferences. PIN THIS TO YOUR MAIN COURSE BOARD OR EASY DINNER RECIPES FOR ENTERTAINING BOARD so you can find it easily when you need it. 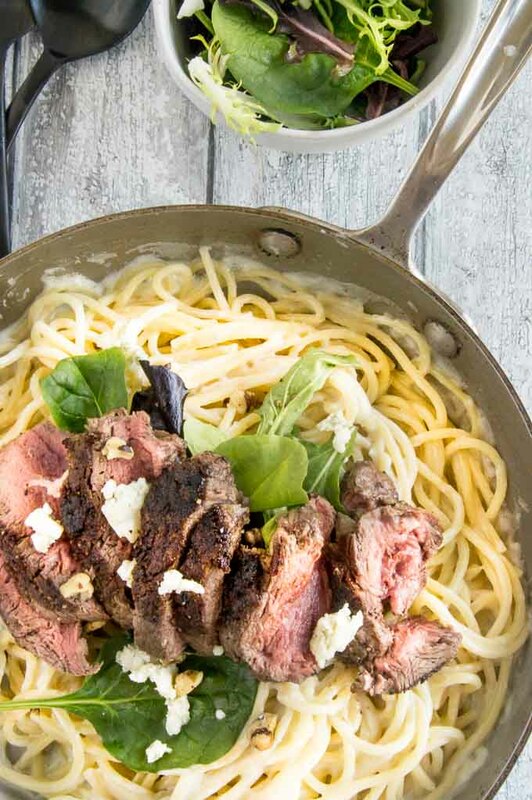 Steak with Gorgonzola Pasta is a budget friendly, yet special enough for company recipe. Made in less than 30 minutes served directly served from the same pan you cook it in! Cook Pasta according to directions on package you purchased. When finished, drain and set aside. While pasta is cooking heat a large skillet to medium high. Season both sides of steak (s) with salt and pepper. When Pan is hot, place steaks in pan and cook to your desired doneness. Remove from the pan and allow to rest while you make the gorgonzola sauce. Place skillet back on stove top and add butter and onion to the pan. Melt butter and continue to stir while the onion softens, about 3 minutes. Add half and half in 1/3 cup increments whisking rapidly to fully incorporate flour. Repeat until all half and half is mixed in and flour has dissolved into the liquid. Continue to cook for 10 minutes or until liquid has thickened and is no longer watery. Slice the steak across the grain at an angle to 1/4 inch slices. Lay steak atop cheese coated pasta in the pan. Serve with your choice of add ins. This dish works well served immediately or at room temperature. What kind of steak did you use? Gimme all the pasta and all the red meat I can handle! I love the creamy gorgonzola sauce! I want to drink it!! I think I died and went to heaven!! This is so good!! I love how you pair the perfect wine with all of your yummy recipes!! This is a new favorite FOR SURE! Gotta love a great meal that won’t break the bank! And these flavors are perfect. So excited about this recipe and will be trying it. Your pictures look absolutely perfect. The steak cooked to perfection! Oh my goodness. STEAK. PASTA. GORGONZOLA. Three of my favorite things! Total date night dinner recipe. What an elegant way to dress up a simple pasta dish! Grocery Outlet sound great as well, can’t wait to check them out. Ooooh girrrrrl you’re speaking my language! I hate blue cheese, but for some reason, I’m a gorgonzola fan – go figure. I love the idea of using it as an almost alfredo sauce for the pasta. And the steak is a given. You can cook me dinner any day, Michele! Thank you for all the great tips about getting wine at great prices. I have to check the grocery outlet for sure. Now that pasta and steak look out of this world! I am getting hungry just looking at the photos. Love the idea of topping it with walnuts and cheese crumbles. This is perfect for entertaining!